The 2015 Gold King Mine waste water spill in the Animas River, in southwest Colorado. The Animas is a tributary to the Colorado River. The Plaintiff in the lawsuit is the Colorado River itself, with the organization Deep Green Resistance – a national organization committed to protecting the planet through direction action – filing as a “next friend” on behalf of the River. The River and the organization are represented in the lawsuit by Jason Flores Williams, a noted civil rights lawyer and lead attorney in a recent class-action case filed on behalf of Denver’s homeless population. We’re improving some technical things on our end for blog subscriptions. To subscribe to news & events for this chapter and/or for our international lists, use the form in the sidebar, or browse all DGR lists. If you received this post by email, it means you’re subscribed via wordpress.com. You’ll keep getting emails for regular posts, but not for calendar event postings or for exclusive alerts. To get them all, subscribe to the list as described above. Then login at wordpress.com to unfollow from the old method. I walked back towards the other car. “Get there,” he yelled pointing to the driver’s door of Markle’s car, “by the door. You disobeyed my order.” I noticed his hand was on the black handle of his holstered gun. “I misheard you,” I said. At this point two more Homeland Security vehicles with their sirens blaring pulled in fast as if this were the moment everybody had been waiting for. When Kozma walked back towards his truck, his hand was still on his gun. Minutes earlier we had been driving down what deceivingly seemed like a lonely two lane road to do the basic journalistic task of conducting an interview. It wasn’t always this way. When Joshua Garcia, a member of the Tohono O’odam Hemajkan Rights Network (TOHRN) was growing up in the nearby Chukut Kuk district, there were a few agents. But the O’odham moved unencumbered and crossed freely back and forth over the international boundary on their traditional lands, which extend hundreds of miles into Mexico, to go to school, go to the clinic, visit family and friends, and to see sacred sites. Garcia remembers when it all changed. There was a night in the mid-1990s when he looked over the western horizon, over the reservation, and saw the sky light up, filled with helicopters and aircraft. “It was like Red Dawn,” he laughed, referring to the 2012 movie that ridiculously depicts the invasion of the United States by the North Korean military. Garcia said that he always associated that night with an incident that happened three days later. Border Patrol agents showed up at his aunt’s house. They said they were tracking footprints into her yard. Was she hiding anybody in the house? She told them that they were the footprints of the children, trick-or-treating, from Halloween. Now the number of Border Patrol agents has gone from few and far between to, as put by tribal member Mike Wilson, an “occupying army.” Garcia says that “it feels like you’re being watched, all the time” on the Nation. 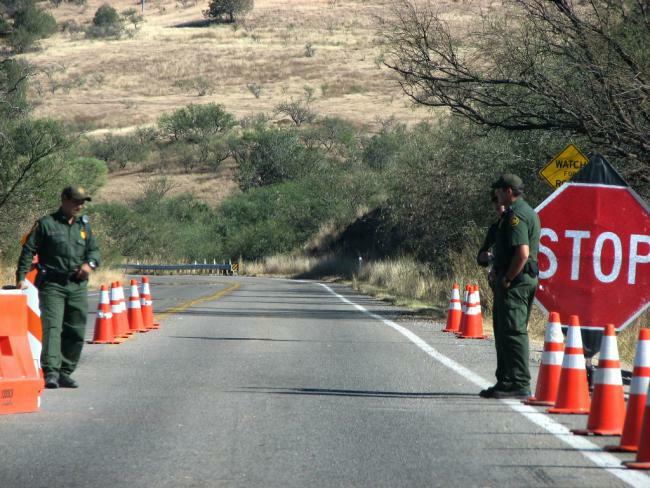 According to the ACLU report, the Nation has become “inundated” with Border Patrol infrastructure. Indeed, the reservation today feels like the location of a post-9/11 Indian war, a collision of centuries. Less than a mile from where we stood, detained in the hot sun, is a substation that the Border Patrol shares with the Tohono O’odham police department. Scope trucks dot the hills, implanted motion sensors monitor foot movement, and surveillance cameras can see at night and during the day. Drones and helicopter do frequent overflights, and I’ve witnessed heavily armed border agents dressed in camouflage patrol the sacred Baboquivari mountain range in search, they say, of smugglers. On the other side of the reservation, which is the size of the state of Connecticut, is a Forward Operating Base, much like the small, rudimentary bases used in U.S. war zones. Around the periphery of the reservation are DHS checkpoints, placed so that you can’t avoid them if you leave the reservation on a paved road. This is a second, internal layer of border enforcement. For the O’odham the movement of everyday life has become rife with difficulties. According to the ACLU report, agents brandishing weapons during normal traffic stops on the reservation is now routine. Agents have stopped and detained a school bus “more than a dozen times.” Each time Border Patrol forces the students to stand out in the heat as they rifle through their personal belongings. One family said that the agents pulled them over after they returned home to retrieve a forgotten item, apparently a “suspicious” act. Over the years, I have heard stories from many people, most who wish to remain anonymous. I have heard about a Tohono O’odham health worker who Border Patrol pulled over after she picked up patients to transport them to a dialysis center. I have heard about Border Patrol blocking a funeral procession and then showing up at the cemetery during the burial. I have heard about Border Patrol using this burial ground (and other sacred places) as a shooting range and driving all over it with ATVs. A man told me that he was simply driving north from the international divide when Border Patrol pulled him over, and six agents surrounded him armed with automatic, high-caliber weapons. He never learned what it was that set them off. I interviewed a man named Arturo Garcia who said Border Patrol pulled him out of his car, pepper-sprayed him, and then knocked him out with a crack of a baton. Tohono O’odham Nellie Jo David, a student of indigenous peoples law and policy, also a member of TOHRN, put it this way: “We can’t visit family, go to the store, attend meetings, participate in our culture, grab a bite somewhere, or say hi to our friends without being accused of something… It is NOT their land. They should NOT have this unfettered power. I’m willing to fight for as long as I live to get that message across.” What David describes is strikingly reminiscent to internal controls of mobility in the Israeli-occupied West Bank. The comparison is not a stretch: the private company Elbit Systems, the lead system integrator of Israel’s border technology plan, is poised to build 15 surveillance towers on the Tohono O’odham Nation in 2016. While Border Patrol presence is particularly striking on the reservation, the ACLU lists off what they call “rampant civil rights abuses” that are occurring throughout the 2,000-mile stretch of borderlands: everything from tailgating at high speeds, to wielding weapons such as knives, electroshock guns, and assault weapons during routine traffic stops. When I asked Border Patrol Agent Kozma why we were being detained, he did not answer. He might have been distracted, alas, because another agent, Rodriguez, was walking in his direction. Moments later Rodriguez called me over to his vehicle. He told us we couldn’t be on Tohono O’odham land without the permission of the tribal government. He called over Markle, and then took both our identifications. He looked at us and said, “This is not an abuse,” as if he were simultaneously sick of and worried about the subject matter. He asked why we were in this area, only “a mile from the border.” It wasn’t safe, he told us. There had been a lot of crossings. You are “unarmed,” he said, we can’t protect you. The agent then asked me why I had approached Kozma “aggressively.” I was so startled by Rodriguez’s assertion that I laughed. “I didn’t approach him aggressively,” I replied. Kozma quickly shot back saying that I had not obeyed his orders. (Fifteen minutes later Kozma would yell at me again when I attempted to retrieve a water bottle from the vehicle. “I don’t know what you have in the car,” he told me). Then, almost following the script of the ACLU report, the agent said that Markle’s California plate was suspicious. Rodriguez told us that when they saw a California plate, it was “either someone running stolen cars or drugs.” That’s why they had to pull us over. This whole thing ended when J. Scott, who was a tall, white police agent from the Tohono O’odham Police Department – one of many such non-O’odham in the force – told us we had to leave the reservation. He said if he caught us filming he would arrest us for “trespassing.” When Garcia stepped forward and explained that he was Tohono O’odham, from the Chukut Kuk District, J. Scott told him he was not from that district. The insinuation was clear: even within the reservation movement is controlled and suppressed. Scott and the Border Patrol vehicles “escorted” us away from the border, from the land of Garcia’s grandparents going back at least a thousand years. That Columbus Day on the Tohono O’odham Nation it didn’t only seem like the Nation was living only in a state of “de facto stop and frisk,” but also in a continued state of Manifest Destiny. Todd Miller is the author of Border Patrol Nation: Dispatches From the Front Lines of Homeland Security. You can follow him on Twitter @memomiller and view more of his work at toddwmiller.wordpress.com. Katniss is real, and she is an Apache. While we were all looking the other way, sacred Apache land (that was also property of the American people as a whole) was sold to an Australian-British mining company that will soon have the rights to leave a 2-mile crater in the area. How did this happen? Senators John McCain and Jeff Flake slipped the deal in at the last minute at the bottom of a much-needed military defense spending bill. 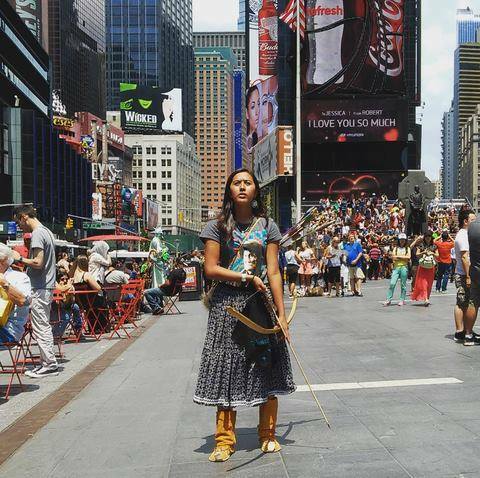 Apache have been camped out on the sacred site of Oak Flat ever since, and this young warrior, along with a handful of others, traveled to NYC all the way from Arizona to try to bring attention to her people’s plight. Let’s help this story spread and let this real life rebel know that she is not alone, and that the American people won’t stand for this betrayal to us all. Arizona Congressman Paul Gosar Orders Apache Stronghold Visitors Removed by Capitol Police,Threatens Grandmothers With Arrest. Visit the Apache Stronghold website for current updates and to find out what you can do to support the Apache in the fight to save Oak Flat. 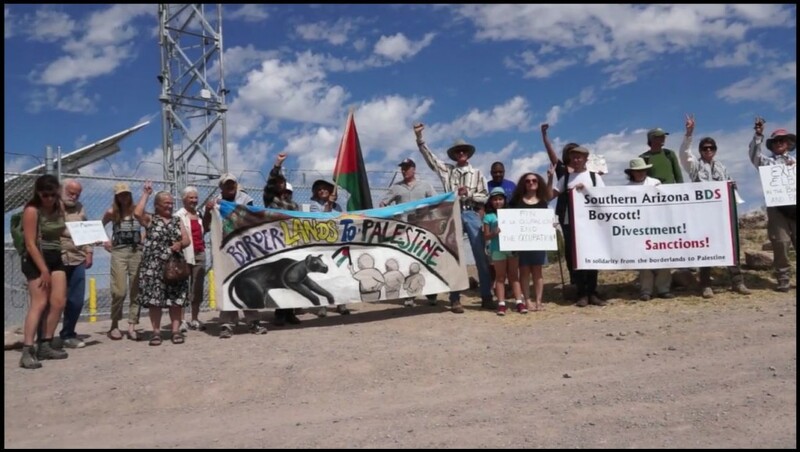 Arizona activists protest Israeli firms militarizing the border, May 2015. On May 2, a few miles from the U.S.-Mexico border, just north of Nogales, on Tohono O’odham land, a group of activists unveiled a banner of protest in front of a new surveillance tower, manufactured and operated by the Israeli company Elbit Systems. The group came to bring border justice, indigenous rights and power, and anti-militarization movements together with the Southern Arizona BDS Network to confront the Israeli/US partnership that is militarizing the US/Mexico border with increasingly profound effects on the people of this region. As is the normal case for residents who live and work in this hyper-militarized border zone, on our excursion to the tower, it didn’t take long for a U.S. Border Patrol agent, on an all-terrain vehicle, to speed up and rush toward our group, asking us what we were up to—and asking us to leave. Read more from the Southern Arizona BDS Network article. Few topics generate more commentary on Deep Green Resistance social media than critiques of alternative energy. For many, solar, wind, and other non-fossil energy sources and technologies represent a pragmatic hope for saving the biosphere. Our position on these technologies is that they represent a false hope for a couple reasons. One, their manufacturing processes are fossil-fuel intensive and involve other nonrenewable resources like metals and plastics. 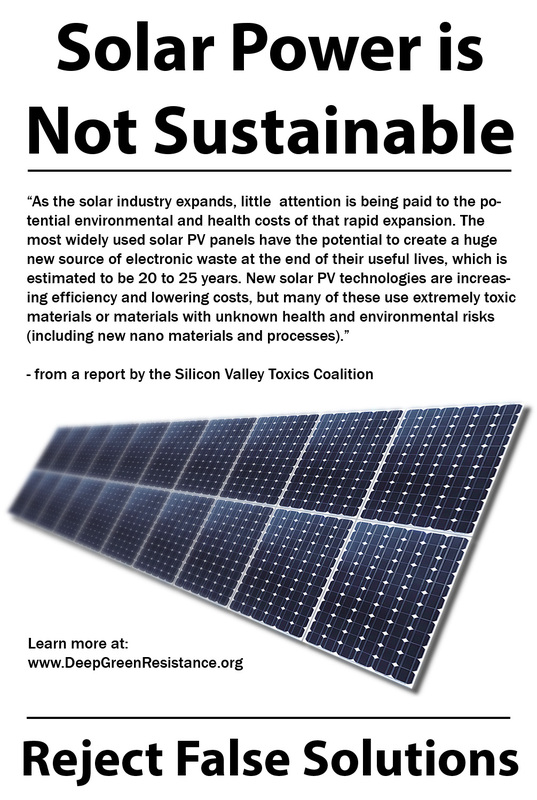 Once built, solar panels and wind turbines have a limited life-span, after which they must be replaced. Two: even if they’re recycled, that process is itself toxic and energy-intensive, and must take place at specialized facilities, which means transportation, which means more fuels and infrastructure. 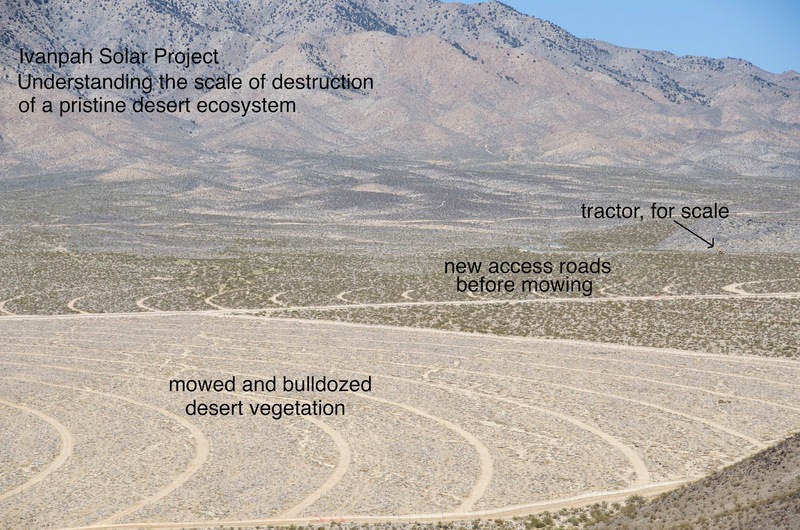 Three: while in operation, both solar and wind facilities kill wildlife by displacement, collisions with turbines, burning in solar mirrors, and so on. We’re not opposed to solutions to problems, as we’re often accused, only to solutions that have so many hidden costs they’re ultimately ineffective. Rather than prolong a system–industrialism–that cannot exist for long on a finite planet, our focus should instead be on a future that it actually sustainable, which by definition means one that eventually will not have artificial electricity in it. This future is coming one way or another; the only real question is how much of the living world will be left when it does. See the DGR page on green technology and renewable energy for answers to frequently asked questions. Read more of this book review by Kim Hill of Deep Green Resistance Australia on the Deep Green Resistance News Service. Note: Though the resistance movement will have different phases and parts, the Deep Green Resistance organization is, will always be, and is committed to only being an aboveground group.